We are thrilled to have the amazing and talented author Jessica Khoury, the author of one of the best books ever, ORIGIN. I am so excited to reveal this interview, and I would like to say thanks a million, in more ways than one! 1. Is there a sequel to Origin? 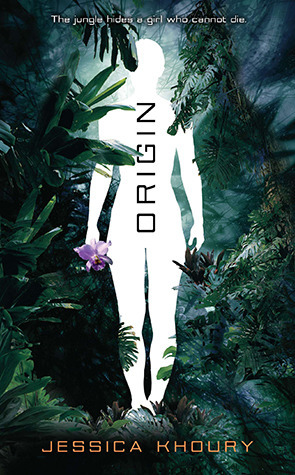 Origin is a standalone novel, so there will be no direct sequels to it. However, there is a companion novel which comes out in January, called Vitro, and which involves another project run by the company behind the Immortis Project in Origin. 2: What is your favorite quote/excerpt from Origin? “Because you are young and free and one with the jungle. You are mortal, but instead of clinging to the hope of immortality, you embrace each day, one at a time, and never worry about tomorrow." - Pia thinks this when she is with Ami, and it is one of the moments when she is thinking about immortality versus mortality. It shows her growing fascination with idea of a life that will one day end, which she herself cannot experience. 3: In Origin, Pia likes M&Ms. What is your favorite flavor of M&M? Well, it's actually Skittles she tries for the first time--of which red is definitely my favorite flavor! 4: What was your dream occupation as a child before you wanted to be a writer? Being a writer was my childhood dream job, but a close second would have been an orca trainer at Sea World! 5: How has reading influenced your life? What are some of your favorite books? (If I have not reviewed some of them I will get on to it :) ) Reading has been my favorite activity since I learned how to read! It is my love of reading which made me want to write my own books. Some of my favorites are Inkheart by Cornelia Funke, Ender's Game by Orson Scott Card, and the Harry Potter books. 6: How did you get the idea for Origin? Origin came in a bolt-of-lightning moment, which began with an image in my mind of a girl trapped by glass walls and surrounded by jungle. I was immediately captivated by her and I ran home as fast as I could to start writing her story. 7: Do you have any other books in progress? Right now I am working on the final edits for Vitro, the Origin companion novel. 8: How long did it take you to write Origin? The first draft took one month to write, which is really fast for me! But I was just so in love with the story that I couldn't stop writing! 9: How did you feel after Origin was released? It was so surreal! I had to keep reminding myself it was real, since it was a thing I had dreamed of since I was four years old. 10: Do you have any advice for future writers or those who have been rejected? Keep writing!! And don't be afraid to make mistakes--sometimes you have to get it wrong before you can get it right. You can always, always improve, as long as you work at it, don't give up, and stay inspired! Why did you choose to leave the end of Requiem so open ended? I actually addressed this in detail in a video post on my blog. Mostly, I wanted the readers to have the space to imagine for themselves what happens after the book ends. Where did you get your idea for Delirium? I was watching a TV news piece about the swine flu, and I started to wonder how people would react if the government told them that Love was a deadly and contagious disease. How were you able to go about getting it published? I have a great relationship with my agent, and my publishers. They're very supportive of my projects. Most of your fans have read Delirium, but not Before I Fall. What (briefly) is it about? It's about a girl who lives the last day of her life seven times, and changes in the process. In Requiem, you left an open ending. In your opinion, do you think Lena ended up with Alex or Jullian? I can't say anything that happens outside of the text of the books, because I don't know! Why does the cure not work on some people, like Lena’s Mother? The brain, and neurology is a very complicated branch of science that we still have so much to learn about. I think that the cure still hasn't been "perfected" yet, so there are exceptions like Lena's mother. Do you think Hana might become immune to the cure? Again, I can't say anything that happens outside of the books! In your short novel, Raven, you revealed that Raven was pregnant. Was it harder to kill her in Requiem than it is other characters because of this? Do you think Alex really liked Coral? All I know is what's in the book! Yes! I have a standalone YA novel called PANIC that will come out in Spring of 2014, and in that year I will also publish my first book for adults called "Rooms". I'm very excited for both! If you have an author in mind that could be interviewed, tell them to email us at countrycutie13@hotmail.com Check back later!! !